Posted By:Unknown | At:8:21 AM Be the first to comment! Domestic Violence is one of those crimes that we hear a lot about, but I don't think we really understand the ramifications of the violence that is inflicted upon people. We got a high profile glimpse into the aftermath of this prevalent form of violence when Rihanna's bloody, beaten face became public after she was assaulted by singer Chris Brown. But unlike Rihanna, there are countless number of women who dwell in the shadows of abuse whose faces and names we never know or see. Such is not the case for aspiring model, Mori Gabriella Montgomery. 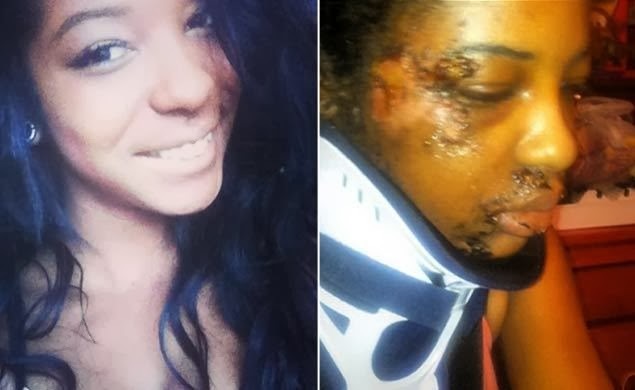 Montgomery took a very public stance against an abusive ex-boyfriend by posting pictures on her Twitter account of her horrific injuries after the man allegedly pushed her out of a moving car and beat her on a Las Vegas street. But she said the pictures of her bloodied body were not meant to show her as a victim, but a survivor. And she wants her story to expose the seriousness of domestic violence. Montgomery said she’s pressing charges against her ex-boyfriend, whom she hasn’t contacted since the attack. And, slowly, she’s starting to heal.